In all new houses and apartments will not see on the electrical panel traditional tubes, instead are machines protection. They are not only the tubes but also much more reliable. When choosing machine protection is always the question arises – what is the current that it needs to be calculated? Properly selected circuit breaker must trip in case of circuit or under load, significantly exceeding the. At the same time, it should not turn off if you, for example, turned on simultaneously, an electric kettle and a washing machine. That is why pick up circuit breaker specifically for your wire and load. Purchase machines protection only in specialty stores, it will with high probability to buy a quality product. Remember that the rated current of the switch should not be above the maximum allowed for your network's current load. In other words, the machine should work and not burn wiring. Calculation of parameters of circuit breaker is as follows. Suppose that you include an electric kettle with a capacity of 2 kW. Divide the power in watts at 220 volts, will receive a current of 9.1 A. This figure can be rounded down to 10 below in the calculations was some stock. Hence, the circuit breaker must withstand a current of 10 amperes. Now calculate the total capacity all at once include of your electrical appliances and calculate, as above, the strength of the current. Let's say you have a 30 amp so the breaker must be rated for this current. After spending the previous calculation, you have calculated what the current should be calculated automatically switch. But you also need to know what is the current that will sustain your network, but it depends on wires. For example, if the wiring is made of aluminum wire 2.5 mm (the most common variant), it is able to withstand a current of 24 amperes and a load of 5.2 kW. So, in your case, the breaker should be rated at a little less than 24 amps. If you use copper wire for this section, it will withstand a current of 30 amps and the load is 6.6 kW. When using the wires of another section to find the data for withstanding current and a load on the Internet. Mounting in the house wiring, try to foresee its division into several isolated circuits. For example, make a separate lighting circuit and the wiring to the outlets. 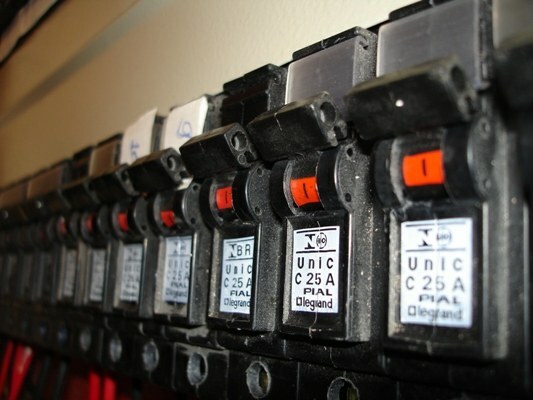 This will allow you to install each circuit on a separate breaker that would significantly increase overall security. Appliances such as washing machines or electric water heaters, additionally include using an RCD – residual current device, able to protect the person from defeat by an electric current. RCD responds to leak, so in case of touching the phase wire will immediately shut off the current.